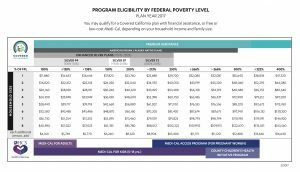 Every January the Department of Health and Human Services releases the new Federal Poverty Level (FPL) figures, which outline Covered California income limits. The FPL is “The set minimum amount of gross income that a family needs for food, clothing, transportation, shelter and other necessities.” The reason this number is important in the context of health insurance is that it’s used in calculating whether or not you qualify for a subsidy and if so, how much. It’s also a part of determining whether or not you qualify for Medi-Cal. Other information is also taken into consideration but the FPL is the starting point. The big question for us is, when does Covered California switch from using last years FPL to calculate eligibility to the current FPL. This is extremely important because not only can your subsidy amount change depending on how the FPL changes, but you may not even qualify for the same coverage! Unfortunately the answer is a bit complex. According to Covered California, eligibility determinations use the prior year’s FPL Guideline for the entirety of the coverage year. However, Medi-Cal implements FPL Guidelines around the time they are released every year. This year they were implemented in May. This effectively raises the Medi-Cal eligibility ceiling from when they implement until the next coverage year when Covered California implements the same year FPL guidelines.